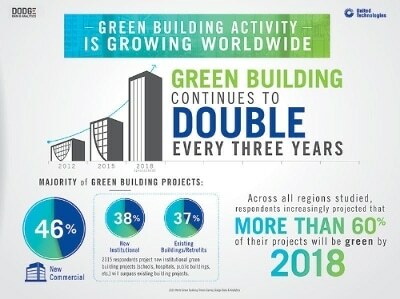 According to a recent report, soon to be released by Dodge Data & Analytics, green building continues to double every three years, with strongest acceleration in emerging economies, and clients and tenants worldwide are increasingly demanding sustainability – for both energy efficiency and occupant benefit. Preliminary results from the World Green Building Trends 2016 report, with funding from United Technologies, were announced by Bob McDonough, President, UTC Climate, Controls & Security at the 2015 Greenbuild International Summit in Washington, DC earlier this month. The new report surveyed more than 1,000 architects, engineers, contractors, owners, specialists and consultants in 69 countries to understand their current green building project involvement and expectations for 2018. In addition to expanding the sample size by more than 25 percent over the 2012 study, the new report also has a higher percentage of architect and contractor participation across a larger number of countries. The findings, which will be fully available in early 2016, reaffirm 2008 and 2012 research that green building is doubling every three years and introduce new trends, the latest drivers and barriers for green building. The largest percentage of green building activity continues to be in the commercial building segment, comprising 46 percent of respondents’ future green building projects. An enhanced awareness of the occupant and tenant benefits of green buildings emerged in the 2016 report, with healthier neighborhoods (15 percent), higher return on investment (11 percent), and employee recruitment (5 percent) increasing as drivers. The survey also examined potential barriers to green building development. Among the findings, half of survey respondents noted higher perceived costs as the top barrier to green building, a notable decline from 80 percent of respondents in 2008 and 76 percent in 2012. Other barriers differ by country. Developing countries regard lack of public awareness and lack of political support as a key barrier, while in the U.K., the perception that green is for high-end projects only was cited.